Efferent nerve (nervus abducens) - VI pair cranial nerves, the motor nerves that Innervate only outside straight muscles of the eyeball (m. rectus bulbi lateralis) (Fig.). The core of efferent nerve lies at the rear of the bridge close to the middle line under the bottom of a diamond-shaped holes, and is separated from the knee to the facial nerve (see). On leaving the kernel fiber O. N. go down through the entire cross-section of the bridge and take approximately the same position as fiber hypoglossal nerve in the medulla. 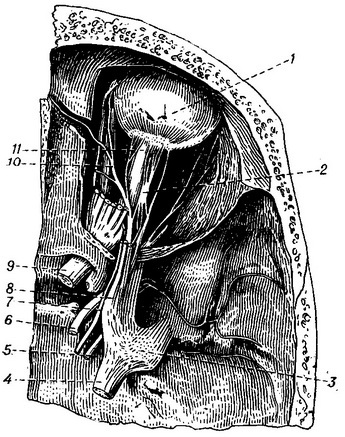 Efferent nerve comes to the surface at the boundary of the bridge and the medulla oblongata, at the outer edge of the pyramid at the front side of the furrow. The core O. N. closely connected with nuclei oculomotor and vestibular nerves through the rear longitudinal beam (fasciculus longitudinalis posterior, s. medialis), which has especially great value for functions of orientation. The cells of the kernel O. p. end of the fiber and collaterals pyramidal tract, which connect this kernel with musculoskeletal part of a bark of the big hemispheres of a brain. From all of the cranial nerves O. N. passes the greatest distance at the base of the brain, which explains the particular frequency of damage in pathological processes, localized in the area of the base of the brain, brain injuries, fractures of the skull base and tumors. In peripheral lesions efferent nerve restricted or complete loss of movement of the eyeball outwards, diplopia, converging strabismus (strabismus convergens). 10 - nn. ciliares longi.